Patna, Feb 4:A shutdown called by the Rashtriya Lok Samata Party (RLSP) to protest against a police lathi charge which injured party chief and former Union Minister Upendra Kushwaha hit train and road services in Bihar on Monday. The state-wide strike was supported by the Rashtriya Janata Dal (RJD), Congress and Hindustani Awam Morcha (HAM). Kushwaha and half a dozen RLSP workers were injured on Saturday in the state capital. Protesting RLSP workers on Monday blocked roads and and stopped over a dozen long-distance and passenger trains in Patna, Gaya, Sasaram, Buxar, Jehanabad, Supaul, Hajipur, Bhagalpur, Darbhanga, Nalanda and Katigar districts. They halted the Rajdhani Express and Amritsar Express at Buxar railway station. 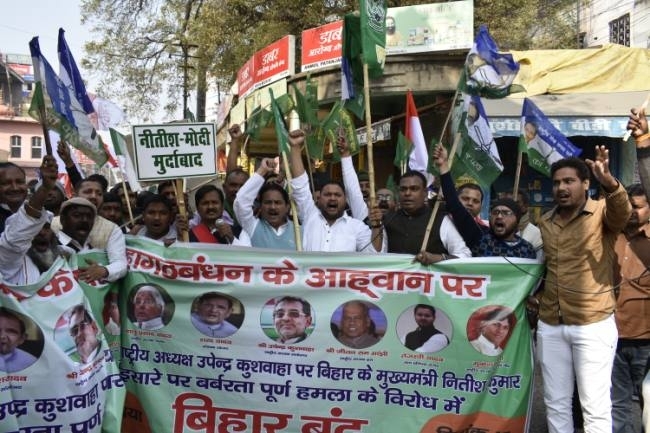 In Patna, scores of RLSP leaders and workers, joined by their counterparts from RJD and HAM, took to the streets. They blocked roads at different areas in the city. The RLSP was protesting against the alleged collapse of school and higher education system in Bihar on Saturday when the police charged at them. Kushwaha last year walked out of the BJP-led NDA and joined the alliance of RJD, Congress and HAM.